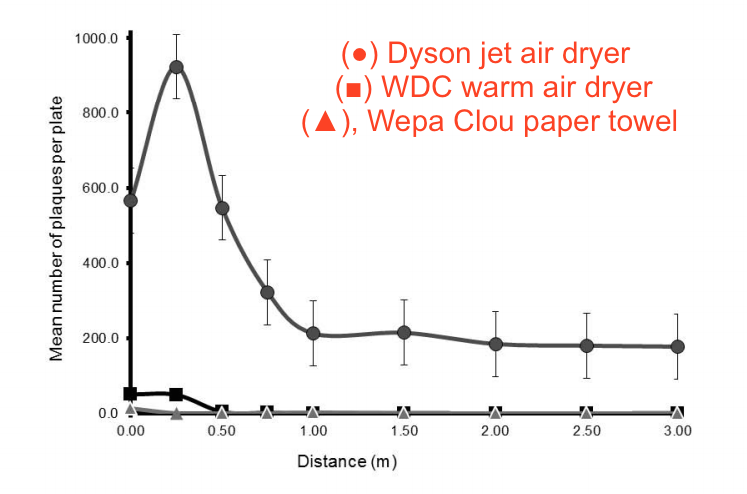 Aims: To use a MS2 bacteriophage model to compare three hand-drying methods, paper towels (PT), a warm air dryer (WAD) and a jet air dryer (JAD) (Note EB: a Dyson), for their potential to disperse viruses and contaminate the immediate environment during use. Participants washed their gloved hands with a suspension of MS2 bacteriophage and hands were dried with one of the three hand-drying devices. The quantity of MS2 present in the areas around each device was determined using a plaque assay. 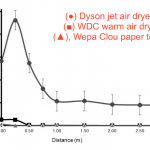 Samples were collected from plates containing the indicator strain, placed at varying heights and distances and also from the air. (…) Use of the JAD lead to significantly greater and further dispersal of MS2 bacteriophage from artificially contaminated hands when compared to the WAD and PT. 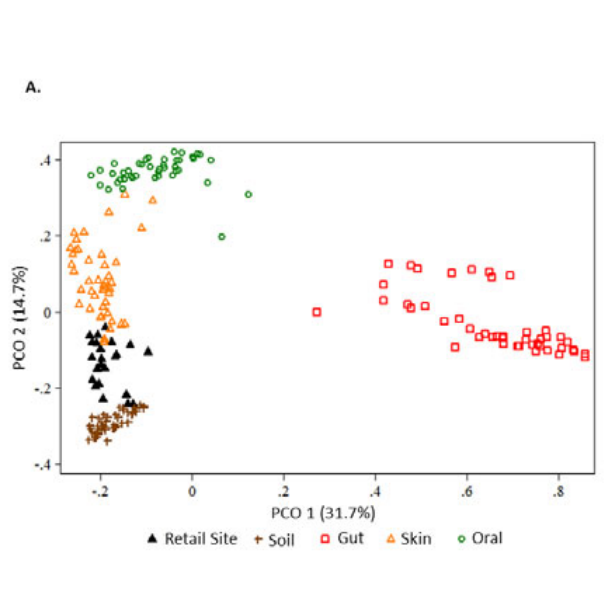 The microbiota surviving sanitation of salmon processing conveyor belts was identified and its growth dynamics further investigated in a model mimicking processing surfaces in such plants. 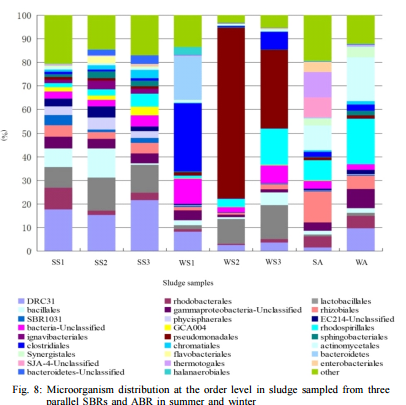 (…) A diverse microbiota dominated by gram-negative bacteria was isolated after regular sanitation in three salmon processing plants. 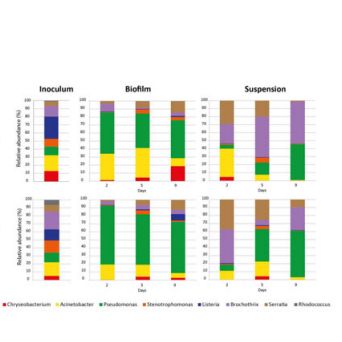 (…) High-throughput sequencing showed that L. monocytogenes represented 0.1 – 0.01% of the biofilm population and that Pseudomonas spp dominated. Interestingly, both Brochothrix sp. and a Pseudomonas sp. dominated in the surrounding suspension. 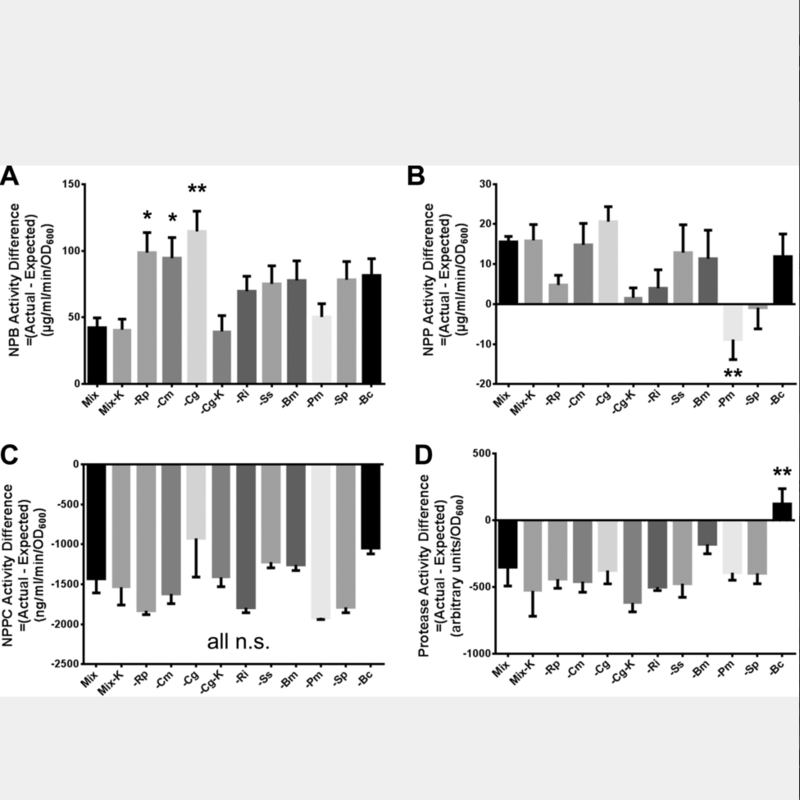 Our goal was to investigate the impact of individual community member absence on the resulting community production of exoenzymes (extracellular enzymes) involved in lipid and protein hydrolysis. Our model community contained nine bacteria isolated from the potable water system of the International Space Station. Bacteria were grown in static conditions individually, all together, or in all combinations of eight species and exoproduct production was measured by colorimetric or fluorometric reagents to assess short chain and long chain lipases, choline-specific phospholipases C, and proteases. (…) We conclude that in this simplified model of a drinking water bacterial community, community structure imposes constraints on production and/or secretion of exoenzymes to generate a level appropriate to exploit a given nutrient environment. Thiocyanate is a common contaminant of the gold mining and coal coking industries for which biological degradation generally represents the most viable approach to remediation. 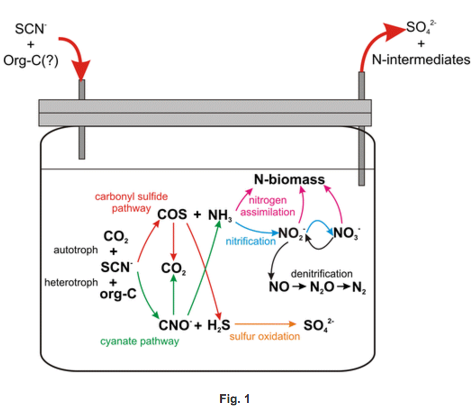 Recent studies of thiocyanate-degrading bioreactor systems have revealed new information on the structure and metabolic activity of thiocyanate-degrading microbial consortia. (…) High throughput sequencing, DNA fingerprinting and targeted gene amplification have now elucidated the genetic and metabolic diversity of these complex microbial consortia. (…) Here we review these rapidly advancing studies and synthesize a conceptual model to inform new biotechnologies for thiocyanate remediation. Some microorganisms have the capacity to interact with arsenic through resistance or metabolic processes. 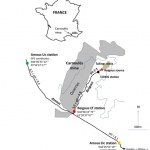 Their activities contribute to the fate of arsenic in contaminated ecosystems. To investigate the genetic potential involved in these interactions in a zone of confluence between a pristine river and an arsenic-rich acid mine drainage, we explored the diversity of marker genes for arsenic resistance (arsB, acr3.1, acr3.2), methylation (arsM), and respiration (arrA) in waters characterized by contrasted concentrations of metallic elements (including arsenic) and pH. 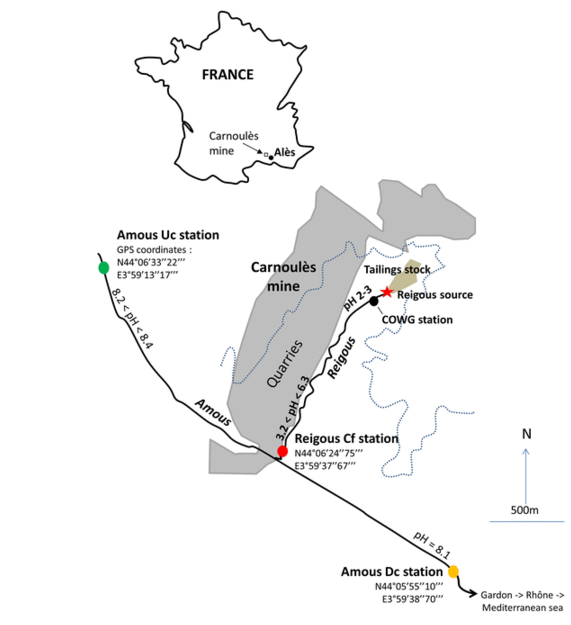 (…) This is the first report of the impact of an acid mine drainage on the diversity and distribution of arsenic (As)-related genes in river waters. The fate of arsenic in this ecosystem is probably under the influence of the abundance and activity of specific microbial populations involved in different As biotransformations. 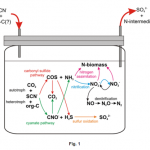 This study investigated the microbial community in a full scale anaerobic baffled reactor and sequencing batch reactor system for oil-produced water treatment in summer and winter. The community structures of fungi and bacteria were analyzed through polymerase chain reaction—denaturing gradient gel electrophoresis and Illumina high-throughput sequencing, respectively. 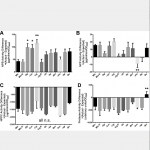 (…) The fungal communities in anaerobic baffled reactor and sequencing batch reactor were shaped by seasons and treatment units, while there was no correlation between abundance of fungi and chemical oxygen demand removal rates. 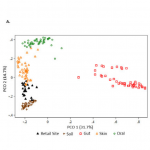 (…) Although microbial community significantly varied in the three parallel sulfide reducing bacteria, the performance of these bioreactors had no significant difference between summer and winter.